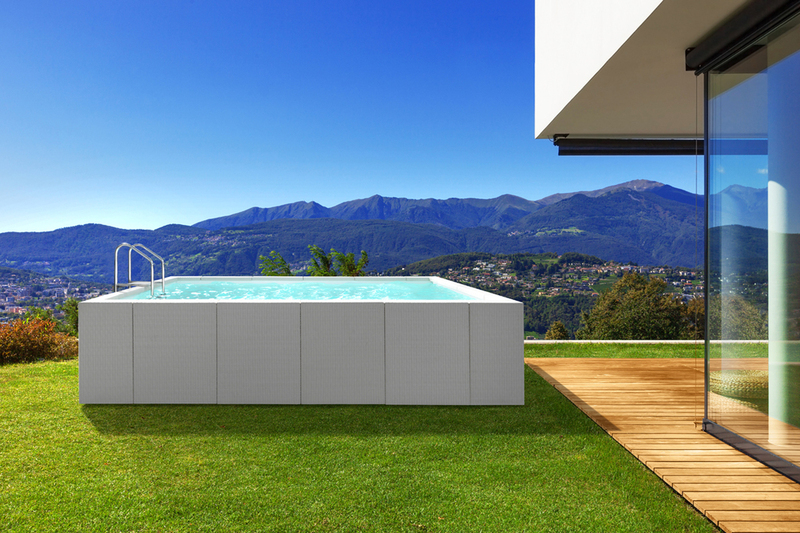 The Dolcevita Diva is a new breed of above-ground swimming pool. Surrounded by luxurious handmade panels made of hand-woven fabric, the Diva is a stunner. Enclosed in those panels is a sturdy frame made of a combination of stainless steel and epoxy-coated galvanized steel for strength. Available in 10x16 , 10x20 , 10x23 , 13x26, 13x30, or 16x33, the Diva comes complete with light, skimmer kit, vacuum cleaner, and ladder, all of which help make owning a Diva a fun and fulfilling experience. The Dolcevita Playa turns your backyard into an Oasis. Taking its design cues from the Diva, the Playa is expanded with comfortable lounge seating that you can customize to fit your lifestyle. Cushions are made with a weather-resistant material and are available in a number of different colors. The Playa is made to the same exacting standards as the Diva, and optionally comes equipped with a 2KW heater and bubble pump. It is available in sizes 7'2", 10'5", or 13'8" long.